About halfway through the month of January, the oak trees’ leaves changed from orange-ish to green! It’s such a nice change. One of my only qualms about winter in AC:NL is the sad, orange-brown, dead-looking leaves on the oak trees. The winter leaves could have at least been a dark purple color like they were in past games. I got the next highest version of the Traveler badge (the silver edition), mostly as a result from visiting back and forth a lot between my two copies of the game. Btw this might be one of the last times I convince Melba to stay, because I’ll be letting her go eventually. 😦 It’s nothing to do with her, but it’s because of her house, which isn’t aligned with the other houses nearby and doesn’t match my house exterior theme that I’m doing (houses with fairytale doors). 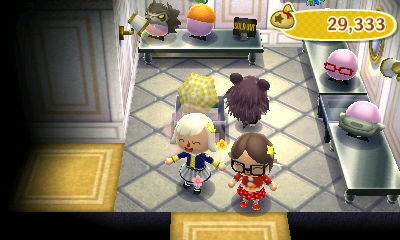 I’m determined to have Erik move out first, though, and having Melba be the last villager to ever leave. This Letter Writer badge was kind of an interesting one to get! I’m not usually a huge letter-writer, but I’ve been sending lots to Erik in the hope of boosting my friendship with him so that he might move sooner. I don’t know if this strategy/method works at all, but it’s based on my personal experience in the past; the few times I sort of ignored certain villagers (for example, I ignored Henry for a while…), they took forever to move, and finally moved out once I started becoming better friends with them. And I know that some of the neighbors I have the highest friendship with (Melba, etc.) have asked to move out multiple times. My thinking behind this theory is that once you’ve reached a high friendship threshold with a villager, the game feels that you have gotten to know the villager enough for their stay in town to feel complete enough to then let them go and meet someone new. I didn’t come across a pink wetsuit in this round of CT island-hopping, but I found this white one, which seemed like it might be fitting enough for Estel! I like it when the path through my residential area seems busy like this! An especially heavy snowstorm, which at the time, I just thought was really pretty to see! After a few days I started to repair the damage from the previous snowstorm, but then there was another one, which completely obliterated all my progress and made it even worse than it was before. >_< I started to feel disappointment whenever I saw it was snowing…I guess it's good if you want to repair dirt patches, but it's bad if you have dirt paths you want to maintain! I run laps on the paths every day, but when it snowed it didn't do any good. Posted on April 16, 2014 by Amy •	This entry was posted in AC:NL, Citalune and tagged Animal Crossing. Bookmark the permalink. The meteor’s are quite pretty, aren’t they? Your house looks like an eerie princess castle in that starry pic. true; that’s why I always send food with lazy villager’s letters. I got a new room in my house and went to put my flower furniture into that room, well.. I’m kind of a few pieces short (hydrangea bed for example) and Something happened to my game so I can’t receive flower furniture, umm.. do you reckon you could get the last few bits? I think the princess bed looks great there. Thanks! I can see how early morning screenshots can seem kind of eerily beautiful. Are you missing any pieces besides the hydrangea bed? Because the hydrangea bed is the only one I haven’t tracked down yet, and I thought I gave you all the other pieces besides that one. I’ll work on getting that for you, though! Yeah.. Villagers find it weird if you give them bells for their birthday too. My villagers just give me back the flowers I give them . Hmm.. I have no idea, but I’ll search the flower series up. Are there any wallpaper or flooring that goes with it? Ah, it was the hydrangea bed and hibiscus clock. Nothing else. I don’t think there’s a specific carpet and wallpaper that’s “meant” to go with the flower series, but there are definitely various options that could look good! There’s the flower pop carpet and flower pop wall combo, and there are also wallpaper/flooring combinations that could be used to give an outdoor feel, which would then make the room feel like a garden with the flower furniture. Examples would be wallpapers like the backyard fence, tree-lined wall, or meadow vista, paired with carpets like the daisy meadow or wildflower floor. If you want to browse more options, I recommend the wallpaper and flooring links at MoriDB. I think the princess bed looks great with the rest of your house! The pictures of the meteor shower in front of the town hall look incredible! 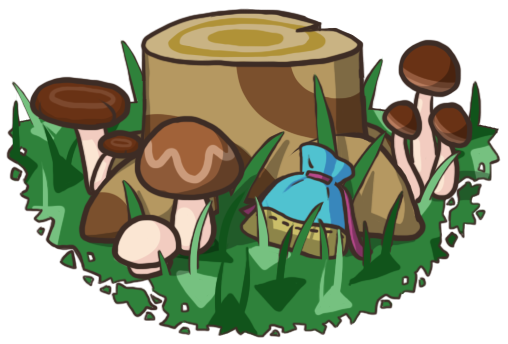 By the way, if you update your dream suite during a meteor shower, will people see the meteor shower when they dream of your town? Thanks! 🙂 Yep, if you update during a meteor shower, an aurora, a rainbow, a special sunset/sunrise — anything weather-related like that — it will be that way in your dream town! The only things that don’t show up in dream towns (as far as I know) are fireworks, confetti, and tents (ie. Katrina’s, Redd’s, etc.). Yeah I wasn’t expecting that either…I don’t remember ever having any problem maintaining them in late summer or fall, even after it rained! But I’ll pay closer attention when I reach rainy season in AC:NL again (remember how we started AC:NL in the rainy season and everyone was so tired of it? xD) to see if rainstorms have the same affect as snowstorms. Aww, I bet you had really great memories playing AC:GC then! xP Wish I could’ve played AC:GC ..
Aah it’s okay, Wild World is a great AC game to start off with too! 🙂 I’m just a bit older so it was AC:GC that I started out with (probably around the same age that you started out with AC:WW). Yeah, maybe it didn’t rain as much in your town, but it was pretty constant in mine; the sunny days were rare xP My tumblr dashboard at the time was full of people complaining about the rain as well, haha. (I did some complaining myself!) 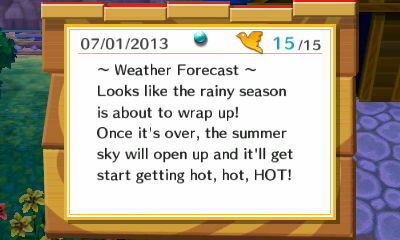 And this bulletin board message alludes to there being a rainy season in June or so. I like the rain too! In moderation… I guess the only thing I don’t like about it is how it gets really cloudy and dark when it rains in AC:NL, so sunsets and stars are obscured, and the lighting around town is duller. I think my town looks best with clear skies, but I’ve seen some dream towns updated during a rainstorm and theirs look quite lovely in the rain! 😀 And I agree that the music box-esque hourly songs are really pretty, and that it’s cute to see everyone out with their umbrellas! I love how Estel looks in the mustache 😆 I also think the white wetsuit will look great on her! Hmm, I personally prefer the regal bed, because even though the princess bed is really nice and cute (I even have one just for that reason), it seems like more of a “dainty”, floral item, which isn’t exactly the impression I get of Estel being… They both look really good, though! Her moving away won’t change the fact that she’s my sentimental favorite, and her stay in Citalune is just one chapter in our history, since she was in my first Wild World town Cutetown and my second main one, Dafdilly — where she’ll continue to stay forever, I hope ^_^ But yeah, things like imperfect house placements and inconsistent/mis-matching/unappealing house styles really bother me for some reason Along with things I can’t control, like rocks, but at least this is a flaw I can control & fix, so I feel it’s best I should do so. Thanks for the feedback! 🙂 I imagine that Estel has a preference for pretty/elegant furniture, but it’s possible that the regal and princess series, while both pretty, do give off different impressions! My worry with the princess bed is that it might be too big and overpower the room a bit in its current layout, like it blocks the view of the full-moon vanity a bit. Well, I see how that could be really annoying 😛 I personally choose villagers because of their appearances and not their house styles, but some of the houses in my town… Marina, why couldn’t you have chosen a better house style?! You’re welcome! I didn’t think about it blocking the full-moon vanity, but it might do that from an angle, I guess? And I would almost say that I thought the princess series would be something that would end up in one of Lyra’s rooms, but I guess it’d be fitting for both girls 😆 Then again, I’m not the one who’s in charge of Citàlune 😛 You’re the only one who can make the decision about who gets what, I guess! Sure, I would love to WiFi sometime! I’m not good at figuring out times, but maybe just shoot me a comment sometime on a weekend, or on a weekday time when we might both be free, and maybe we can meet up then spontaneously! Otherwise we could always try to schedule a time. Glad I could help a bit in your decision with Hazel, she should be a great neighbor (and a great house) to have! Long time no talk, I missed you so much!!! I missed this community in general, I love coming back here and stalking everyone (hahah) when I’m feeling nostalgic. Reading posts like this really make my day. Citalune looks absolutely gorgeous, and the clear sky with stars sparkling through just suits it so well, I also remember getting up early (or just always having my town a few hours behind) just to see the sky clear up, and I loved the little “Good morning everybody” message in Wild World when the clock strikes 6 a.m (don’t quote me on that though heheh). Oh and the sudden change from the relaxing night music to the cheerful daytime tune. Is there still some feature like that in New Leaf? Sounds like you got quite some badges, woot woot!! And that large head snowman… hahahahah. Oh and I love the picture of the busy “residential area” it was the perfect timing!! Wow and I have really got a weakness for regal rooms in Animal Crossing, or anything fancy like that… oh I just love it!! 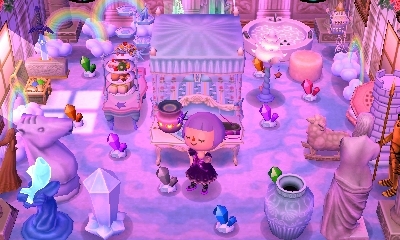 So the princess furniture is absolutely adorable!! So far, I loved just about everything I saw in this post, it all was so beautiful! Anyways, hope you didn’t mind me just appearing here out of nowhere, I hope everything is going well for you!! Hugs!! Awww yay, hiiii Jemma! 😀 What a sweet surprise! 🙂 I’m glad you’re still doing well and like to check up on the community sometimes, that’s really sweet of you! ^-^ And I’m glad you like the post and were able to follow some of it, even though you haven’t played New Leaf! I remember doing that in Wild World too! In addition to loving the lightening (but still deep blue) starry skies in the early morning, I also quite liked the 5 AM music in Wild World. The 5 AM music in New Leaf isn’t as good in my opinion, but the switch from that quiet and slightly eerie 5 AM music to the more jaunty and cheerful 6 AM music is similar to how it was in Wild World, I think ^_^ And I think there’s a similar message at 6 AM in New Leaf, too, and many of the AC games, since it’s considered the start of a new day in Animal Crossing. Hehe me too, I have a weakness for any furniture that’s pretty/elegant/fancy like that as well, like regal and princess furniture and such 🙂 And I love how in New Leaf I can have a castle exterior to match! Oh, gosh!! I had not heard of the WiFi shutting down, but I just looked it up. Oh that’s such a bummer, my DS is broken (not technically but it just won’t charge anymore), which probably means I’ll be purchasing a 3DS sometime soon, because I certainly still love playing Animal Crossing from time to time. And a 3DS means New Leaf!! But this is all a plan I made up in my mind, so my parents might not agree, but I sure hope so! Oh, the atmosphere early-morning really is unique 😮 The way the horizon almost continues into the sky because of the similar hues gives everything an odd, ‘floaty’ feeling xP I played in those early morning hours once (actually super duper late the night before…) and was too sleepy to savour it. Wooah, I never made the connection between precipitation and the grass regrowing 😮 I just thought it was weird how people said grass regrows slower during winter months and mine kept coming back really fast. I can kind of admire the game designers for putting in a detail like that, though it is a pain for maintaining paths -_- I’ve been playing in real time and my paths are still not back (though the grass is paling). Estel’s room looks nice 😀 I think the princess bed is good, and the pink spots and more intricate pattern than the regal bed help it match the other items in the room more. I kept hearing people say that too! And it was very different in my experience, winter was the one time I had trouble maintaining my dirt paths. I think if there’s one time of year that would have the worst grass deterioration and slow re-growth, it would actually be Autumn; I don’t remember getting much precipitation at that time of year.